Golden Eagles in Twin Falls, Idaho and a 705-53 loss Feb. 9, against the Salt Lake Community College Bruins in Taylorsville, Utah. Eastern started the game against CSI on re going on a 12-4 run before the first full timeout was called. The Eagles passed the ball well and hit their shots, playing well as a team during the streak. “We were sharing the ball really well and we hit the open shots. We were playing together as a team, which is exactly what we needed,” Freshman Rylie Tobiasson said. Seconds after the timeout, CSI bounced back into the game, cutting the lead to one point with a minute left in the period. When I got called to go in, my first thought was to play for the team and assist them in any way I could… the second quarter really helped all of us with our con dence and gave us the energy to play harder,” Tobiasson said. line in the first half, which gave them a 12-point-lead at halftime. Starting the second half, the Eagles struggled to score, going 1-7 from the eld and 0-3 from deep. CSI shot 50 percent from the eld and forced three Eastern turnovers. 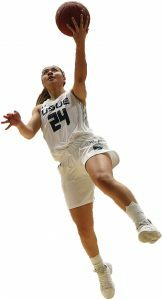 play together,” USU Eastern head coach Chelsey Warburton said. In the third quarter, the Eagles were outscored 10-9 and shot 26 percent from the eld. Despite Eastern’s struggles, they held on to a 50-48 lead to end the quarter. In the third alone, the Eagles were outscored 19-9 and shot 26 percent from the floor. However, the team changed their play in the fourth quarter and went on an 11-4 run. “We hit some key shots, stayed focused and made plays down the stretch to keep the lead,” Warburton said. Eastern outscored the Golden Eagles 25-17. Guard Lamija Coric led with seven points. She also led the Eagles in scoring on Thursday, with a career-high 23 points. She had two assists and four rebounds, and is ranked 16 in three-point-shooting 44.4 percent. Coric also is ranked in the top four in free-throws in the country. “Lamija set the tone for us early, she played con dent and it showed,” Warburton said. chances and we knew that if they got second chances it would have been a completely different game,” Tobiasson said. Thursday’s win in Twin Falls was the first win over CSI under Warburton and the second win over CSI this season. “It is a loud gym to play in, which makes for a great environment. Tonight’s win was a much needed win for our squad,” Warburton said. The win against CSI moves the Eagles to third place in the Scenic West Athletic Conference standings but with a rough game on Saturday, the Eagles returned to fourth place due to a 70-53 loss against Salt Lake Community College Bruins in Taylorsville, Utah. Eastern’s Fan Appreciation night succeeded in fan support but was a rough game for the players as the Eagles lost 63-53 to the Bruins on Jan. 31. The game was filled with energy and dedication to the eld but the win slipped out of their fingers as the Bruins pulled away with the win. Eastern lost to the Bruins a second time on Saturday, Feb. 9. Eagles and earned a combined six rebounds “Emmery and Ami both had great in the first period. games and are providing us with key minutes as freshman,” War- burton said. The Bruins extended their lead with as much as 10 due to turnovers by Eastern. The Eagles gave up six turnovers in the second quarter, with the Bruins scoring eight points off those turnovers. Even after many turnovers, the Eagles kept the rebounding battle close, with the Bruins leading by one rebound in the first half. The Bruins dominated in shooting in the third quarter, as they outscored Eastern 22-7. During the third quarter, the Bruins went 9-14 from the eld, while Eastern went 3-13. Eastern shot 46.7 per- cent from the eld and 2-4 from deep to outscore the Bruins 20-15 in the fourth quarter. “The team continued to battle, despite our low scoring third quarter,” Warburton said. Leading the team, Ti’a nished with 14 points. Wagstaff led with nine rebounds, 10 points and two steals against the Bruins. final conference game between the Eagles and the Badgers. “Against Snow on Thursday we will need to control the rebounds, push the ball and follow the defensive scout,” Warburton said. Come support Eastern as they take on the Badgers. Thursday’s game is scheduled for 5:30 p.m. inside the BDAC.